Charge: 1. Violation of the Laws and Customs of War between 29 May 1944 and about 2 September 1945 as C.O. of Nagoya Area POW Camp Number 3-B, Funatsu, Gifu, Honshu, Japan and Nogoya Area POW Camp number 1-D, Kamioka, Gifu, Honshu, Japan, did unlawfully abuse, mistreat and commit other offenses against certain Amercan POWs and failing to control, permitting members of his command to commit cruel and brutal atrocities and other offenses against American PWs. Reviewing Authority's Recommendations: The Judge Advocate stated that the accused "was rightfully and properly considered as responsible because he, as Commanding officer of both camps, could not but have known they were occuring." The evidence showed that the accused himself had committed brutalities toward the POWs. Judge Advocate's Recommendations: Col. Sotaro Muratta (Docket No. 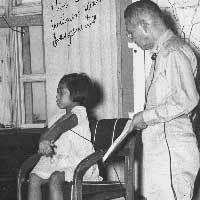 155), superior to Chotaro Furushima was called as a witness. It would be interesting to see what happened to him compared to his subordinate.